Martex has always stood for quality. Other sheets shrink and pill up after washing. Martex sheets don't do that. Comfortable cotton sheets with a nice smooth texture. The Martex T225 Sheet Set is a perfect choice for everyday use anywhere at all - kids' bedrooms, the guest room or the dorm. Made in an easy-care cotton and polyester blend, the fabric is brushed for a wonderful soft-hand feel that's ideal for the cooler months of the year. There are nine colors to choose from so you're sure to find one that works for all. The flat sheet and pillowcases feature 2-inch turn-back hems and the fitted sheet is elasticated with a 13-inch drop. Available in Twin, Twin XL, Full, Queen and King sizes. The set includes a flat and fitted sheet and pillowcase(s). The Twin/Twin XL comes with one standard pillowcase;full and queen come with two standard pillowcass and king comes with two king pillowcases. Additional pillowcases are sold separately. If you like crisp, cold sheets these are for you. They remind me of the sheets I used to have as a child. The interesting thing is they are not as thick as most sheets are that give that cold feeling. Hopefully that will help to keep a cool feeling when the temperatures heat up. We purchased the black sheets. They are a deep black and held their color through the first washing. They did wrinkle a little out of the dryer but we pulled them right away which I think helped keep it to a minimum. The fitted sheet fits well onto a deep mattress and the full elastic is a plus. Overall, I'm pleased with the purchase and will buy these again. nice blend of cotton and polyester. However,these were very obviously seconds. One pillow case was open about 4 inches at the pocket end. You could see where the chain stitch on the machine had run crookedly and gone off the case. left a big hole in he end of the pillow case. threads hung from various ends of the flat sheet. Great quality for vacation rental homes! We have these sheets in 2 of our 3 vacation rental homes, as well as on our bed at home. The quality is great, and the feel of the sheets is crisp and clean. If you are super fussy, you'd probably want to iron them as they come out of the dryer, as they do crush a little, but apart from that, absolutely love them. My only problem is finding them in the white in the queen side - they are so popular they are often out of stock. Would recommend if you like crisp, clean feeling sheets. I bought a grey and white set. One is going to be a Christmas gift and one is for myself. Great quality sheets, very soft. Great sheet would recommend highly. feels good. fits my deep mattress and topper well. Sheets are crisp and as described. Fits our sofa pull out mattress well. Best sheets I have ever bought....all our other nice sheets have been gifts over the years. I plan to buy a couple more sets and get rid of our old ones. 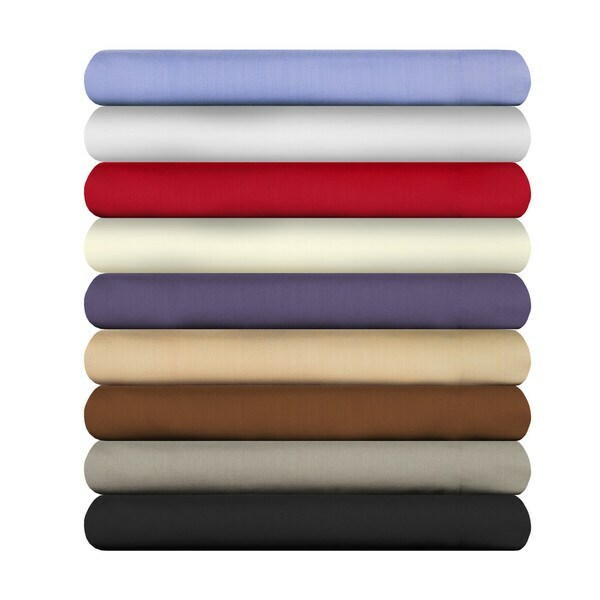 I ordered 1 set of these queen size sheets in paprika color. I was very disappointed after the first time these sheets were washed they have already started unraveling at the stitched hems. They were supposed to be a very high thread count quality sheet set. I will not purchase this brand again. These are really nice, thick, heavy sheet that really wrap you up at night--which has been really nice during this wet Northern California winter! Love the sheets, I will buy them again! Very nice sheets. Washed the immediately and they held up perfect. Didn’t get too terribly wrinkly. I highly recommend these sheets. Can’t beat them for the price! Sheets are not very soft. When I washed them they did not fade or colors run. I think these will last a long time in our vacation rental. It did take a while to ship but they came when I needed them. Next time I would purchase a higher thread count. They are ok sheets, the pillow cases are very tight, I only have standard pillows and it was struggle. "Is the color "Ebony" the same as "Black"? Trying to match extra set of pillowcases to sheet set." Yes, ebony is the same as jet black.